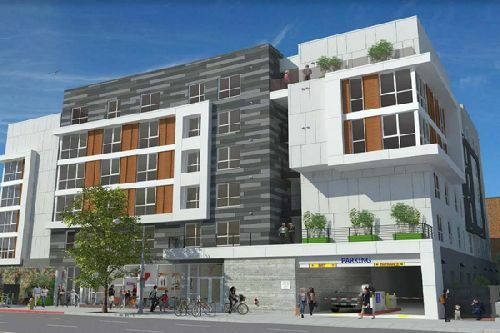 Meta Housing Corporation and Western Community Housing have formed a joint venture to develop Vermont Corridor Apartments, a six-story, transit-oriented senior and permanent supportive housing multifamily community in Los Angeles’ Koreatown neighborhood. The project is located at 433 S. Vermont Ave, a couple of blocks north of Wilshire Blvd. The $51.4 mil project will provide affordable housing for seniors aged 62+ earning between 25 and 60 percent of area median income. Of the 72 units to be built at the property, 36 will include supportive services funded through the County of Los Angeles' voter-approved Measure H, and subsidized rents for residents experiencing varying levels of homelessness. These units were constructed with funding from voter-approved Proposition HHH from the City of Los Angeles and a partnership with the Housing Authority of the City of Los Angeles (HACLA), the Los Angeles Housing and Community Investment Department (HCID) and the County of Los Angeles. Vermont Corridor Apartments will also include a 12.5k sf community center on the ground-floor dedicated to the YMCA that will provide community services through its local partnerships and service offerings. The new development is a reuse of an underutilized County property that will provide a quality and safe environment for residents at an affordable cost while reducing blight in the area. The development will also generate an estimated 321 construction jobs and seven permanent jobs. Vermont Corridor Apartments will feature one- and two-bedroom floorplans for residents and a two-bedroom manager’s apartment. The development will offer generous common spaces including open-space courtyards to encourage interaction among residents. The project is expected to be completed in March 2021. The 113k sf apartment community will be constructed to LEED Gold standards and is located three blocks from the Metro Purple Line’s Wilshire/Vermont station with many other amenities including a grocery store, a pharmacy and medical clinic, public schools, stores and restaurants, and a library in close proximity. The development is also less than a quarter mile from Shatto Recreation Center, which comprises sports fields, facilities for community events. Meta Housing Corporation and Western Community Housing will serve as co-developers and general partners on the project. Western Community Housing will also coordinate resident services, while The People Concern will coordinate supportive services. Westport Construction Inc will serve as the general contractor, with Y&M Architects as architect. AMJ Construction Management will handle construction management, and The John Stewart Company will manage the property.